I have been wanting to make some color sand projects with my son, cause it brings back great memories as a child. We always made these with my mom or when we went to fairs. So the other day I went into the craft store to get some and couldn't believe the price of colored sand. I didn't buy any and went home alittle sad, until I was out with my son drawing with colored chalk and it kept rubbing off on my hands and a light went off....lol. 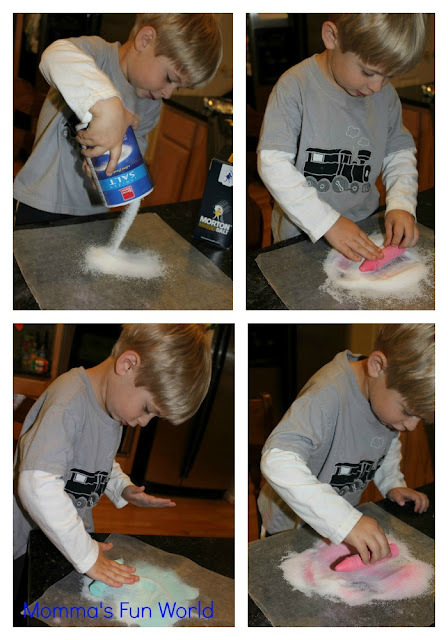 After we were done I came inside and got some salt and colored chalk and we made our own....very easy and cheap. If you like this be sure to check our Crab sand art and Scented sand. ﻿﻿﻿Thanks for stopping by to see what fun stuff we are doing. If you like what you see please come and follow us over on FB and Pinterest, would love to have you. Also, please feel free to share the fun things you are doing with us.